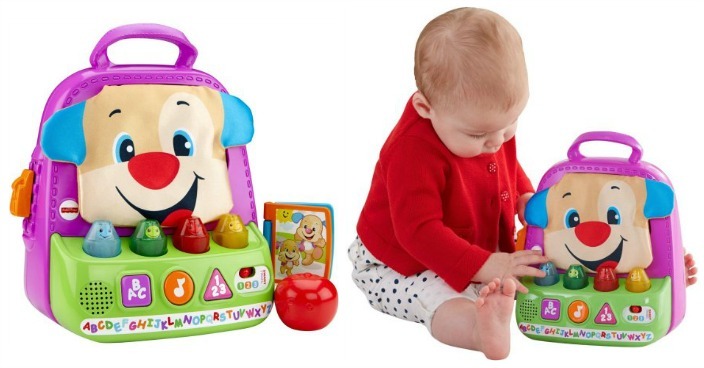 Laugh & Learn Smart Stages Teaching Tote Just $9.88! Down From $16! You are here: Home / Great Deals / Laugh & Learn Smart Stages Teaching Tote Just $9.88! Down From $16! Right now you can get this Laugh & Learn Smart Stages Teaching Tote for just $9.88 (Reg. $16) at Walmart! Plus you can get FREE shipping on order over $50 or FREE in-store pickup! The Laugh & Learn Smart Stages Teaching Tote is packed with fun, including some first Spanish words and phrases — and three levels of play that grow with baby! There are four interactive light-up crayons that sing as a quartet and teach colors as baby presses them. The tote also features three buttons to push that teach shapes, colors and numbers, a clicker zipper and a book and apple rattle that fit inside. The big handle makes it easy to take Puppy and all the fun with you on-the-go! Tote opens, closes for put-and-take play — and everything stores inside! The Smart Stages Teaching Tote includes Smart Stages technology, an exciting new way to change learning content as baby grows. Every baby develops at his or her own pace and Smart Stages technology gives you the ability to select the stage that’s best for your child! There are a variety of developmentally appropriate songs, phrases and sounds within three levels of play — just slide the switch for level changes.